Microsoft Dynamics CRM by MicroChannel, a Gold Certified CRM Microsoft partner, can empower your organisation with a business solution that enables you to market smarter, sell effectively and provide customer service seamlessly. CRM can help to reduce cost and increase profitability by organising and automating business processes that nurture customer relationships and satisfaction across all interactions. Microsoft Dynamics CRM or now known as Dynamics 365 Sales is an integrated and data-driven business solution that assist businesses to manage and maintain customer relationships, track leads & opportunities, marketing, pipeline and deliver actionable data. The Microsoft Dynamics CRM solution works perfectly as a stand-alone application or it can be used seamlessly with other apps in the Microsoft Dynamics 365 platform to deliver a powerful integrated business management system. CRM gives salespeople a single view of the customer, all sales activities, marketing campaigns and customer insights; thus automate sales processes, marketing initiatives and service management. The CRM provides information and insights that salespeople need to seal deals anywhere, anytime. Microsoft Dynamics CRM enables organisations to deepen customer loyalty by providing personalised, proactive and predictive experiences across all channels. Customer team is empowered with a unified experience, enabling them to manage customer’s expectations effortlessly. Powerful social tools in the hands of your sales, marketing and service teams enable to gain insight into how people feel about your business, and to proactively connect with customers, fans and critics. The social analytics give you more insight and interactive analytics with richer data to gain true understanding of your customer. Improve your overall sales and marketing functionalities by aligning the team with planning and tracking tools. Run multiple campaigns across different channels using email marketing, website funnels, and offline events. Target audiences based on LinkedIn interactions using Dynamics 365 Connector for LinkedIn Lead Gen Forms. Why MicroChannel as Your Preferred CRM Partner? The Microchannel team is equipped with varied implementation experience for different industries, providing a wealth of capabilities and expertise to deliver the best possible outcomes to you. MicroChannel has the capability to manage projects across different countries, leveraging on our network of strategic alliances. Check out our offices across Australia and Asia Pacific here. Leveraging on the experience of its 20-year-old parent company, MicroChannel offers the same level of expertise and superior solutions. Dynamics 365 is a flexible solution that allows you to customise your requirements according to your business needs. Use the CRM as a standalone or together with the other apps as an integrated business solution. The CRM functionalities cover Marketing, Sales, Customer Service, Field Service and Project Service Automation. 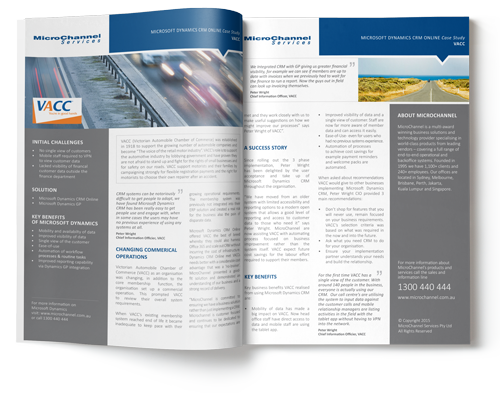 Amongst our list of satisfied CRM customers include VACC (Victorian Automobile Chamber of Commerce) who has benefited from the implementation of Microsoft Dynamics CRM.